They might be similar games, but futsal and football have some big differences separating them. One of the very big differences is the role that the fusal goalkeeper plays. At times, you will see them playing almost like any other outfield player and it’s not that unusual in futsal for goalkeepers to score goals! (By the way, here’s a more detailed list of the differences between futsal and football). When the futsal goalkeeper plays like an outfield player, you’ll often hear them referred to as a ‘fly goalkeeper’. 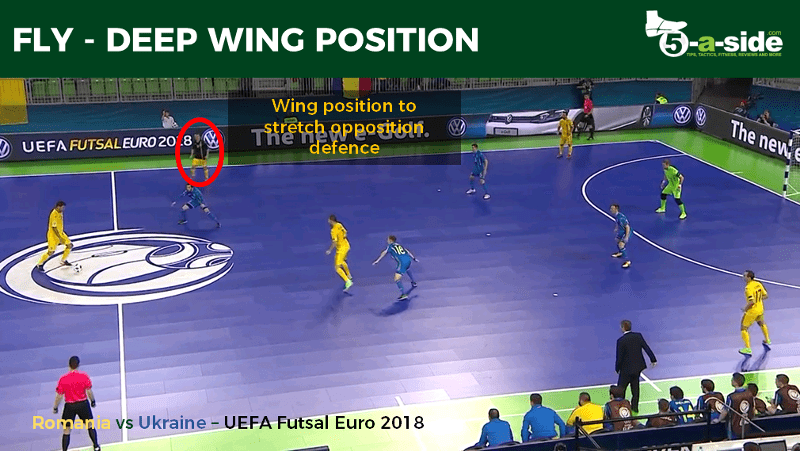 In this article, we’ll look further at what exactly the fly goalkeeper is, the rules applying to them, and the tactics behind using one. What is a fly goalkeeper? The term ‘fly goalkeeper’ is used in futsal to describe where a goalkeeper temporarily assumes a role that resembles an outfield player and is most often used where teams are losing and want to push an extra player forward to join the attack and outnumber the defenders. Some, refer to this situation as a ‘power play’. The term is thought to originate because the goalkeeper is said to be ‘flying’ forward, or ‘playing on the fly’. The Brazilians call this position the goleiro-linha [the so-called ‘fifth man’, a goalkeeper who joins the outfield players]. 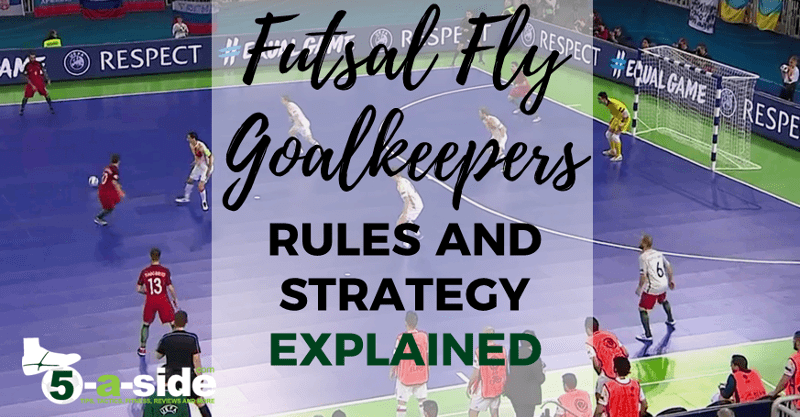 There are specific rules covering what a futsal goalkeeper can and can’t do, and these are key when understanding the role, tactics and limitations of a fly goalkeeper. You can find these in FIFA’s Laws of the Game. After playing the ball, he touches it again in his own half of the pitch after it has been deliberately played to him by a team-mate without an opponent playing or touching it. Touches the ball with his hands inside his own penalty area after it has been deliberately kicked to him by a team-mate. Touches the ball with his hands inside his own penalty area after he has received it directly from a kick-in by a team-mate. He can’t ever have the ball in his possession for more than 4 seconds at a time in his own half. Once he’s touched the ball in his own half (hands or feet) he can’t have it back again in his own half unless an opponent has touched it. Crucially, these rules only apply to the goalkeeper in his own half. In the opposition half there are no restrictions on the goalkeeper playing the ball with his feet. He can have as many touches as he wants, for as long as he wants, just like any other outfield player. This is key to understanding the strategies behind using the fly keeper. A player or substitute replacing the goalkeeper must wear a goalkeeper’s jersey with his number on the back. So, any substitute may swap with the goalkeeper through the normal rolling-sub rules, although they have to be wearing a goalkeeper’s shirt (generally at an amateur level, a bib will be fine). As we’ll see further on, this allows teams to have a specialist fly goalkeeper that comes on and temporarily replaces the normal goalkeeper. When do futsal teams use a fly goalkeeper? The fly goalkeeper is most often used when a team is losing. Instead of attacking the opposition team with 4 outfield players, the addition of the fly goalkeeper means that there are effectively 5 players attacking. The idea is that the five attackers will be able to overwhelm and stretch the defence, freeing up an attacking player in a position to score. With this strategy, the fly goalkeeper is often an ordinary outfield player (who might have already played as an outfield player in the same match) who puts on a goalkeeper jersey. If at any point the ball is lost, the fly goalkeeper will quickly substitute off for the normal goalkeeper until their team has possession of the ball again. This is less common, but some teams have used the fly goalkeeper as a way to keep possession of the ball when they are ahead. Eventually, the opponent has no option but to take risks in winning the ball back, at which point this should free up space nearer the opponent’s goal for a shot. Here the fly keeper is being used when the team in possession have the upper hand. The opponents are forced into having to press the ball, drawing them away from the goal and creating space for the attackers. Where you have a goalkeeper that is both outstanding as an outfield player and as a goalkeeper, you can switch between normal goalkeeping and fly goalkeeping options in a much more fluid way. The goalkeeper can assess by himself when is right for him to come forward, or when he should stay back as a traditional goalkeeper. This strategy is most famously employed by the Kazakhstan national team at the moment. They have a goalkeeper, Higuita, who selectively comes forward as a deep-lying option for his teammates to pass to. Possessing an excellent shot, he regularly tests the opposition goalkeeper with efforts from distance. He tends to position himself just inside the opposition’s half when his team is attacking. Higuita, Kazakhstan’s Brazilian born goalkeeper plays as comfortably with his feet as he does with his hands. As shown above, he often brings the ball into the opponent’s half, shooting at goal (and often scoring) if opponents do not close him down. R Kelly once sang ‘I believe I can fly’, but he probably didn’t have a clue what he’s doing as a futsal goalkeeper. Avoid similar false claims, with these 5 important things to know when you’re using a fly keeper. 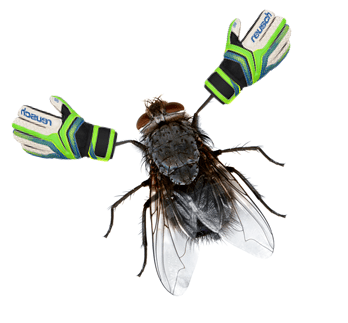 If this is your idea of a fly goalkeeper then we need to have a talk. First, you’ll need the right individual to play this role. One non-negotiable trait they need to have is being safe in possession, not only able to pass the ball accurately, but also possessing the ability to pick the right pass. Having the ability to shoot from distance is also a very useful skill for a fly goalkeeper. Most of the professional teams, when they are using the fly goalkeeper, designate a specific outfield player to play that role (but obviously dress him in a goalkeeper jersey). They will then substitute on for the normal goalkeeper when their team is in possession of the ball. Tactically, the attacking team will usually line up in a U shape keeping two very advanced players either side of the opposition’s goal. If the attacking pressure is sustained, the goalkeeper is usually not the furthest player back. This is simply for the reason that once the goalkeeper has touched the ball in his own half, he can’t do so again until the opposition has touched it (otherwise an indirect free kick is awarded). So, keeping a non-goalkeeper as the deepest player avoids having to worry about this possibility. 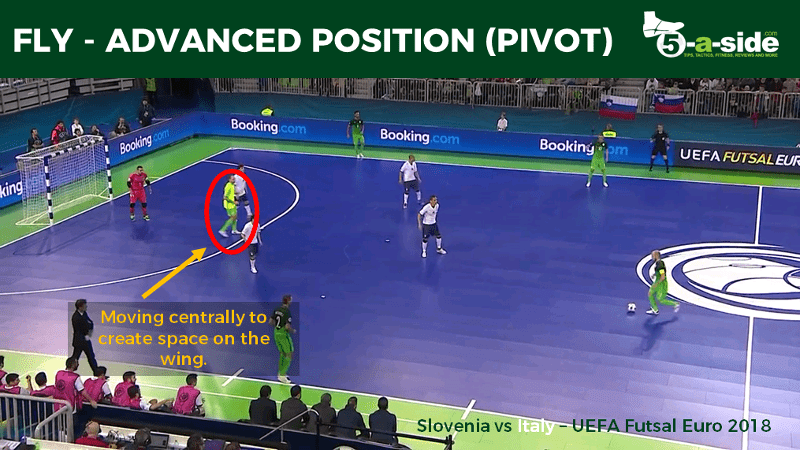 The non-goalkeeper can drop back as much as they want to receive the ball, but the fly goalkeeper stays firmly inside the opposition half where there’s no danger of getting penalised. Here Slovenia play their fly keeper in a very advanced position near the opposition goal. In this instance he has moved centrally to create space on the left wing. It’s all about waiting for the right opportunity when a team is using the fly goalkeeper. The ball is worked between the players as they try to move the opposition defence around either to create the shot for one of the deeper attackers, or a pass to the far post for one of the furthest players forward to attack. Giving the ball away is extremely costly, so players need to be very careful when in possession. In the above example Portugal are playing an outfield player as their fly goalkeeper in search of the equalizer in the Futsal Euro 2018 final. 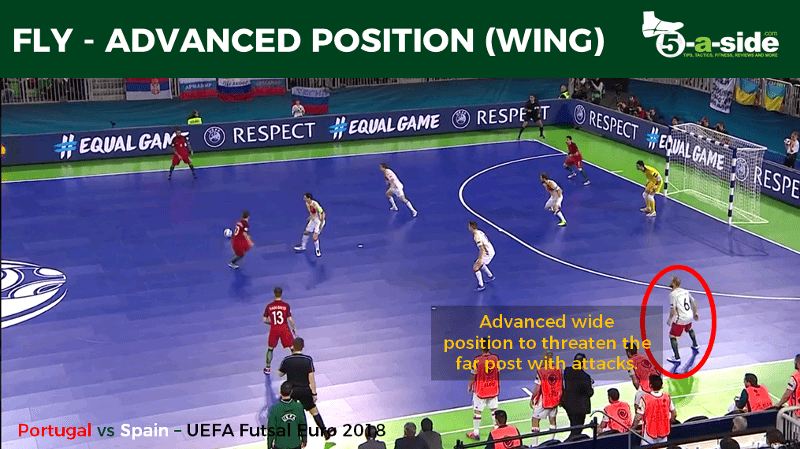 In this advanced wide position the fly keeper stretches the opposition and looks to attack at the far post with well-timed runs. When the time does come to have a shot at goal, whichever player shoots, it must be hit firmly so that the ball doesn’t simply trickle into the hands of the opposition goalkeeper. Not scoring is one thing, but just passing the ball into the hands of the opposition keeper is much worse. Good opposition players, if they see an empty net to aim at, will simply launch the ball into it before you can recover. Lots of goals get scored this way. When you lose the ball, your team need to react very quickly. If the situation allows you to substitute the fly goalkeeper back off for the normal goalkeeper then that’s worth doing, but generally all players will need to scramble back or put enough pressure on the ball to hold play up so the keeper can get back in position. Be careful as you substitute off the fly goalkeeper. In your urgency to get it done quickly, don’t forget that they need to leave the court before the replacement comes on. So, you want to see what it looks like. Here’s the Japan men’s national team showing how it’s done. Hold on to your hats when the music comes on! And here is one of the most famous uses of the fly goalkeeper. 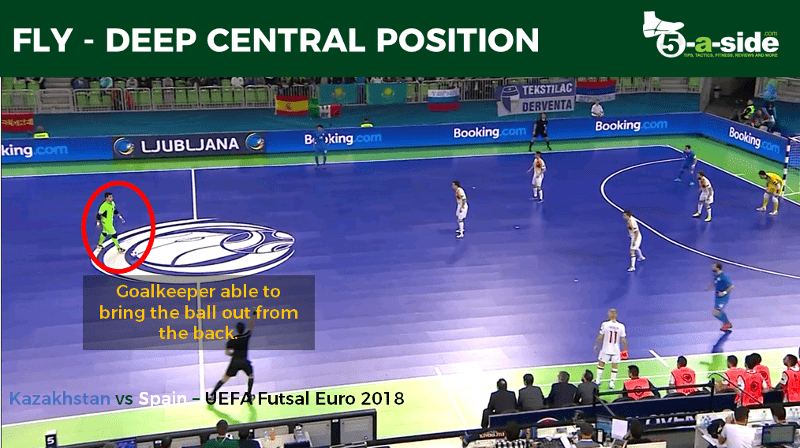 With only 1:40) remaining in the 2018 UEFA Futsal Euro Final, Spain led Portugal 2 goals to 1. Then, out came the fly goalkeeper for the powerplay and the scores were leveled to take it to extra time! If the Spain fly goakeeper had put away his chance right at the end, it could have been a different story. Not everyone likes the fly keeper idea. Used well, the fly goalkeeper can be a really exciting feature of futsal. The criticism is, however, that it can lead to very long periods of play where only one team is touching the ball, where they do nothing more than play very safe, simple passes. A number of suggestions have been offered by the futsal community to improve the excitement for the fans, when a fly goalkeeper is used. Few people are arguing to do away with the fly goalkeeper altogether, but two common suggestions are raised to limit them. 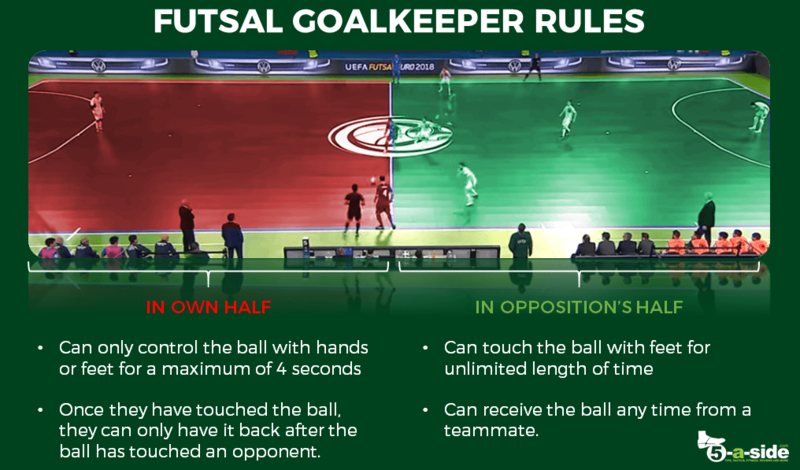 First, you could impose a rule that once a goalkeeper has touched the ball in the opponent’s half, that team can’t pass it back at all into their own half. That stops players dropping very deep and receiving the ball in lots of space, then picking a nice safe pass forward, and then rinsing and repeating the process dozens of times whilst the fans get bored. Instead, it would force some attacking impetus, and the whole team would be forced to operate in the opposition half making the most of the overload situation. Doug Reed is a big fan of this approach and has written about it here. The second idea is to impose a shot clock (which they have in basketball, of course). Again, once the goalkeeper received the ball in the opposition half, a 20 second timer begins. This wouldn’t restrict a team from going back into their own half, but would force them not to simply play possession for the sake of it. hey, excellent content. Your comment “The criticism is, however, that it can lead to very long periods of play where only one team is touching the ball, where they do nothing more than play very safe, simple passes.” is very interesting. I actually play in a local league where there are no restrictions what so ever on fly keepers. And good teams who are winning start playing the “very safe fly keeper” in the last 10 mins which is very frustrating.. Question is: What do you recommend as a counter-strategy / tactic for this? Really, I’d lobby to get the competition organisers to change the rules! If there are no restrictions whatsoever then that’s going to make it really tough as they can really stretch the court and just play endless keep-ball. In this case, it’s very difficult to come up with an effective strategy. If you sit in and soak up pressure then they will just play among themselves in their half. If you go chasing it, they will get in behind. Best advice is to defend as a unit and when the press is on, do it in a coordinated way, trying to all close things down together so that you shut down as many passing options as possible for the player who is on the ball. Good luck! I tend to play in goal in futsal from time to time and love the flexibility that you get from the fly goalkeeper rules. Several times I’ve picked the ball up and started running forward to start attacks! Teams who know how to use this tactic, at an amateur level, have a clear advantage over those that don’t. Thanks for the article. Definitely! This is a huge weapon for any team that can use it well. Glad you enjoy playing it. I’ve done the same and really enjoy it too.